Washing your wounds – salt water or fresh? Can salt water heal a wound any faster than fresh water? When my son cut his finger at the beach last month, he remarked several days later that the sore felt and looked better much faster than he expected. What can you tell about washing your wounds? No, salt water doesn’t heal a wound any faster than fresh water does. 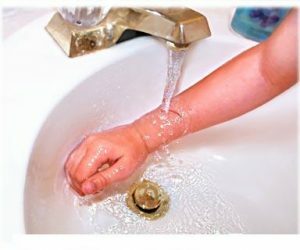 The real key to healing a cut, scrape or other wound is washing it with lots of water. In the hospital, we frequently use a type of sterile saltwater solution – called saline solution – to clean wounds. Yet we also use fresh water, with similar success. As a surgery professor used to preach to the medical students: “The solution to pollution (germs) is dilution (water irrigation of the wound).” So if washing with soap and water is too painful, then wash with water only.